Our Mission: To inform the South. About the Fun, Recreation and Entertainment to fill your life. If you are looking for "things to do" in the south, that is what we are about. The "Home" tab reloads this page when clicked. If you hover over the "Home" tab, a drop-down list with our other stores and contact information will appear. "Media Electronics" is our latest store, it has all the electronics you need for your entertainment needs. "Misty's Boutique" (FOR THE SOFTER SIDE OF YOU) is our take on allure and "Music And More" (FILLING YOUR OUTDOOR NEEDS) is about the More... We have CD's, MP3's, and DVDs somewhere in most of the stores. "Intellectual Creations" has paintings, books, music, DVDs, software and game downloads.Southern Acts was copied from "Southern Acts II" for surety reasons when we moved the southernacts.com domain to here and added the events sub-domain. We look at these as different stores in our on-line strip mall. Maybe we should be renting out space? We plan on continuing to build our site, expanding it to cover all of your entertainment and recreational needs. The "Contact Us" link is on the bottom of this drop-down menu. The "Musical Instruments" tab is our online musical instruments site, you can find Microphones, Guitars, Keyboards, Bass Guitars, Drums & Percussion. Compare our prices, from accessories to new and used instruments, we meet or beat most you will be able to find. The advantage of being powered by the worlds largest on-line retailer. If you hover over the "Musical Instruments" tab, you will find what we call our "Shows" - slideshow presentations of some of our available instruments. The "Announcements" tab takes you to our blog that we announce new events on. If you hover over the "Announcements" tab, we have: Our "Movies" page is some of the top DVDs out according to Google Trends, and the "Instant Videos" is a few of the thousands of streaming/downloadable videos you can you can rent or buy to watch now. The "Best Acts" tab takes you to a link page of acts by name, that takes you to their upcoming events. 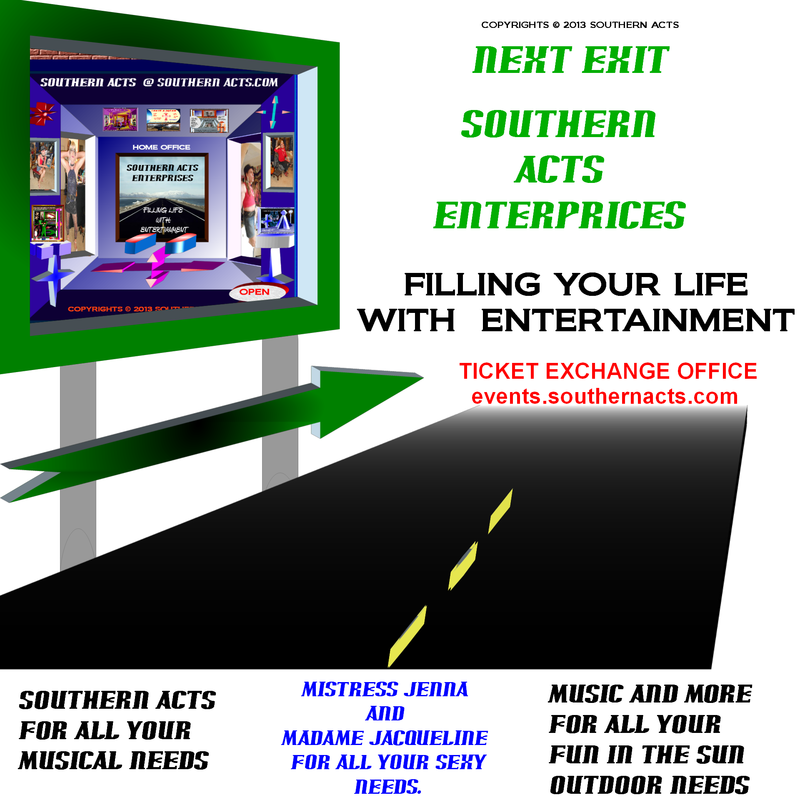 Hover over the "Best Acts" to see our "Act Pages" these are acts that have came or are coming to the south. Click on any of these to listen to a concert of mp3 album samples and more... These are the experience pages we are working on that we hope will keep you coming back. Right now they have a mp3 player and a slideshow of products by the act and a link that opens to their upcoming events. The "Books" tab takes you to our blog about the books we are publishing. Hover over the "Books" tab to see our "Book Pages," click on these to read books on site. Thanks For Visiting Southern Acts!